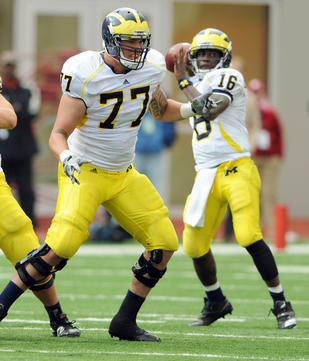 Posted on Thu, Oct 28, 2010 : 6 a.m.
Redshirt freshman left tackle Taylor Lewan will make his fifth consecutive start for the Michigan football team Saturday at Penn State. Standing in the home office of Rich Rodriguez, the impulse struck the high-school recruit. He had just finished a tour of the coach’s Saline home, eyeing trophies, pictures and bowl-game artifacts from the coach’s West Virginia past. Now he cast a glance at his father. “Coach, you mind if my dad and I have a private conversation,” Taylor Lewan asked Rodriguez. Rodriguez closed the door on his way out, leaving father and son alone in his office. “Dad, I want to do this,” Lewan said. His dad, Dave, reminded him of tentative plans to visit Oregon, Nebraska and UCLA and cautioned that he would live with his decision. But he knew better than to try and preach patience. Taylor walked behind the coach’s desk, pulled out the chair and sat down. “This feels right,” he said, making himself comfortable. “You’re not here to coach the team,” his dad retorted. The pair left Rodriguez’s office and found anxious Michigan coaches waiting in the kitchen, their elbows propped on the counter, all wondering what had transpired behind closed doors. Michigan offensive tackle Taylor Lewan, left, provides protection for quarterback Denard Robinson against Indiana earlier this season. One minute, Taylor Lewan breathlessly describes waiting for teammate Patrick Omameh to devour eight eggs benedicts, three omelets and a muffin in a single sitting at a breakfast buffet. “We were like, ‘All right, Patrick, we’d like to go home now,’” he said. The next, he’s recounting daily skirmishes with Michigan linebacker Craig Roh, his practice adversary and best friend from their days together at Chaparral High School. “Craig’s a subtle punch-in-the-stomach kind of guy,” he said. Not that Lewan is above landing a cheap shot against his friendly rival. “I am the cheap shot,” he said. There’s nothing understated about the gregarious, 6-foot-6, 294-pound redshirt freshman, who expects to make his fifth consecutive start at left tackle Saturday against Penn State (8 p.m., ESPN). Off the field, he spins stories about his teammates that keep a group of reporters howling with laughter. On the field, he captures opponents’ attention with a self-described nasty, defensive-minded streak that he melds with a receiver’s flair for the dramatic. “My job is to piss people off,” he said. It’s an approach that sometimes invites trouble. Against Iowa two weeks ago, officials flagged Lewan for two false starts and a personal foul - all in the first half - before Rodriguez benched him. Against Indiana, officials penalized him for a personal foul immediately following Denard Robinson’s game-winning touchdown. They claimed he stepped on a Hoosier laying on the ground; Lewan maintains someone from the bottom of the pile grabbed his leg and tripped him. Either way, Rodriguez marched onto the field to whisk the left tackle away before the situation escalated. Watching the tempest unfold on television, Charlie Ragle, Lewan’s high school coach at Chaparral, laughed. “I’ve got a half-dozen stories like that,” he said. Against Apache Junction High School his senior year, officials flagged Lewan for multiple holds and false starts. When Lewan “said something stupid” back to the referee, Ragle grabbed him by the facemask and escorted him off the field. Lewan didn’t start out with an aggressive streak. In third grade, he tried out for the local kids’ hockey team near his home in Scottsdale, Ariz. During tryouts, a kid Lewan remembers as “twice his size” barreled down on him and checked his hockey career into oblivion. The aversion extended to the football field. He played cornerback that same year - he was the fastest kid on the team - but never adjusted to the contact. It wasn’t until he started riding dirtbikes in the Arizona deserts near his home that he hardened. Not only could he tolerate contact after a while, he developed a daredevil streak. Friends built 30-foot jumps that they zoomed off at 50 miles per hour. Lewan broke his wrist in one memorable spill. Another left a scar on his chin. “He had no fear,” his dad said. Lewan still didn’t have much of an interest in football. Cactus Shadows High School held practices in the evening to avoid the worst of Arizona’s temperatures. One particular night the summer before his freshman year, it was still 100 degrees outside. 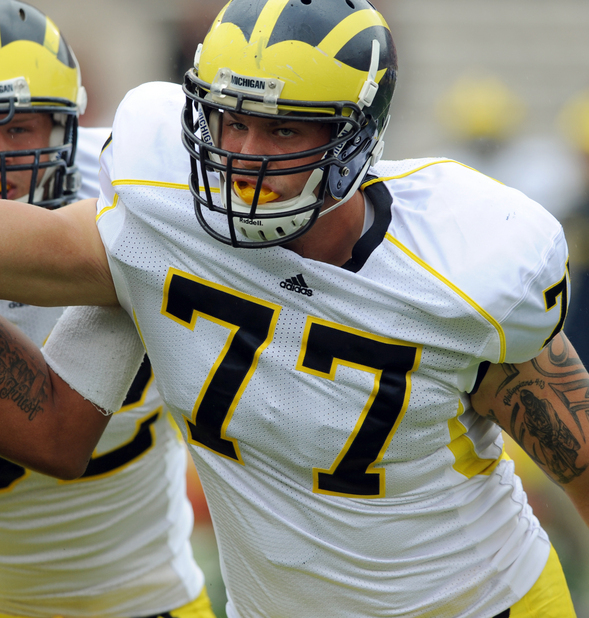 Dave Lewan underwent surgery on his left lung in high school after cysts caused it to collapse. Doctors stapled it together, and he played two years of college football as a walk-on at Minnesota. During his sophomore year, his right lung collapsed, ending his career. He had been eager to watch his son play football, but balanced that desire with a reminder not to push too hard. That night, under the scorching heat, he instructed Taylor to go tell his coach that he’s quitting and said he’d wait in the car. As a graduate assistant at Arizona State, Ragle primarily worked with the school’s offensive linemen. In one year with the Sun Devils, he helped produce three NFL players. So when Lewan, who played defensive tackle his first three years of high school, transferred from Cactus Shadows to Chaparral in the spring of 2008, Ragle immediately knew he had unearthed an unpolished gem. Summer camp started with Lewan slotted as the team’s starting left tackle. After a few practices, coaches experimented with him at right tackle, a move designed, in retrospect, as a test. Coaches wanted to gauge his reaction. It provoked one. Later that day, Lewan vented to his dad. Five minutes later, the impulse struck. The next day, Lewan returned to left tackle. That season, college scouts flocked to Chaparral to watch Roh. They couldn’t help but notice the team’s punishing left tackle. Certainly not after officials flagged him for excessive blocking. “I turned a guy around and drove him to the other sideline,” Lewan explains. "I didn't even know that was a penalty." Offers poured in from schools across the country for Lewan. Before he knows it, he’s visiting Minnesota, then standing in Rodriguez’s home office making his decision, then packing his bags the next summer. Two hours before a flight from Phoenix to Detroit is scheduled to depart and deliver him to college, Lewan hears through friends that another lineman at Chaparral, sophomore Jacob Ehm, believes he’s faster than him. There’s a detour on the way to the airport. Ehm and Lewan walk to the 40-yard line of the football field. Lewan strips down to his Under Armour boxers. The linemen, both 6-6, barrel toward the end zone. Lewan wins the race, puts his clothes back on, and leaves for college. After regaling the Michigan press corps with stories about his teammates and dirty locker, he’s asked half-jokingly if his bright red sneakers are part of a plan to woo the ladies. “No, but this is,” he said. With that, Lewan presses an index finger under his nose. He reveals a mustache tattooed on the side of his finger - a fingerstache, if you will - and everybody in the room cries from laughter. All he needs is a top hat to complete the dapper look. He revels in the attention offensive linemen aren’t accustomed to receiving - “I’m an attention whore,” he says - loves the fact he’s starting as a redshirt freshman and cherishes Michigan football. Not quite. Shortly after Lewan's arrival, his dad and brother moved to Ann Arbor. Bryce Lewan, 16, attends Pioneer High School and is captain of the Victory Honda hockey team based in Plymouth. Born in Detroit, Dave Lewan feels right at home. He works for a company that measures and manages website effectiveness on the north side of town. Taylor lives in an apartment near the campus with teammates Brendan Gibbons and Fitzgerald Toussaint. Sometimes they’ll go out in Ann Arbor. Sometimes he'd prefer to avoid his favorite spots in his new hometown. “You’ve got some weird people out here,” he said. Pete Bigelow covers Michigan football for AnnArbor.com. He can be reached at (734) 623-2556, via email at petebigelow@annarbor.com and followed on Twitter @PeterCBigelow. Thu, Oct 28, 2010 : 7:30 p.m.
michigan7011 You are absolutely right. That penalty changed the game. Taylor was schooled by a very fine Iowa athlete on how to get under someone's skin. One coaching move I agreed with was yanking him after the penalties. Emotion is good, but he needs to control it better. Look for a great game from him Saturday. Thu, Oct 28, 2010 : 5:02 p.m.
Youve got some weird people out here, he said. Yep, they are known as sparties. Thu, Oct 28, 2010 : 4:49 p.m. Kids quite a character. A little more self control and the skies the limit. Go Blue! Thu, Oct 28, 2010 : 3:15 p.m.
Good job. A2.com needs more of this type of work. Thu, Oct 28, 2010 : 10:35 a.m. I like this kid! I wish we had 11 more like him! (Particularly on defense.) I agree with michboy40, he will be a 'challenge' for the oline coach, but in a way, his attitude, and personality, may well boost this team, on BOTH sides of the ball. Go Blue! Thu, Oct 28, 2010 : 10:12 a.m.
Great story Pete! I hope Taylor learns that penalties hurt him and his team, and finds a way to channel the aggression into possitive performance. Thu, Oct 28, 2010 : 9:18 a.m. I too think he will be a great player but he definately needs to control his emotions. His personal foul penalty on Michigan's second possesion in the Iowa game changed the dynamics of the rest of that game. Thu, Oct 28, 2010 : 7:50 a.m. Funny, inept, embarrassing, untalented: Meet U of M's football team and coaching staff. What can honestly be said about this team that has not already been said about the Detroit Lions? Thu, Oct 28, 2010 : 7:38 a.m. Very interesting story. Lewan may very well be the 2nd coming of Jake Long, who also was starting his redshirt-freshman year. There are a lot of similarities, although Taylor will need to add a little weight still. Hopefully, he'll grow out of most of the penalties though. Agressiveness on the field can be good, but needs to be channeled and controlled. Rodriguez yanked him out of the game to send a message. He'll learn though. I'm looking forward to watching him play for the next few years. Pete, Best story of the year. Does his brother play football too? Or just hockey?